Ask us for recommendations on how to keep your Spartanburg pool healthy and safe with the variety of swimming pool chemicals we keep on hand. 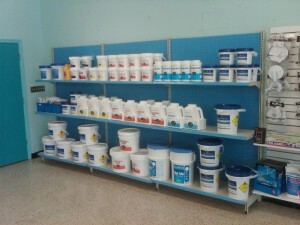 Swimming Pool Chemicals in Spartanburg – Are you worried that your swimming pool doesn’t seem to be keeping its color? Have you noticed a film building on your pool liner, but can’t figure out how to get it clean? Don’t close your pool because you can’t figure out how to get it looking and operating its best! When you need help choosing swimming pool chemicals that will help with your pool maintenance, come to us at Ricky’s Pools for all your needs. At Ricky’s Pools, we have been providing comprehensive pool services for over 20 years, and we are your one-stop-shop for swimming pool chemicals, accessories, and any other pool products in Spartanburg, South Carolina. We can assist you with new pool installation or pool repairs when they arise. Just give us a call, and we’ll get you on your way to the perfect outdoor space. Contact us at Ricky’s Pools today!